Belgium. This "Staunton" set was bought in Anvers. Of course this does not mean that the set must have been made in Belgium. In fact I don't know, as I don't know the exact age. Denmark. Danish sets from around 1800 are delicate. The 1st set is a nice example of an early Danish set. Very often you see finials in opposite colours, but not in this set. Denmark. The 2nd set is about the same age or a little later. It has the typical opposite colours in the finials. Further it comes in an interesting cassette (or box) with a board at the inner side of the lid. The cassette is signed by "BJ? Eriksson Stockholm". Most likely one of the previous owners. Denmark. The 3rd set here was indicated as Danish, but it could easily have been made in Germany. I have seen similar Rooks in a Geislingen bust set. I'm not sure of the date either. There is aanother set, most likely made in Denmark, on the Sweden page. Hungary. This Hungarian set is made in war time or soon after, and resides in an adapted box of the American Red Cross food distribution for "ömlesztett sajt", cheese spread. Once it did belong to Michael from class 3b. In fact it is more a curiosity, but it has some history. Poland. 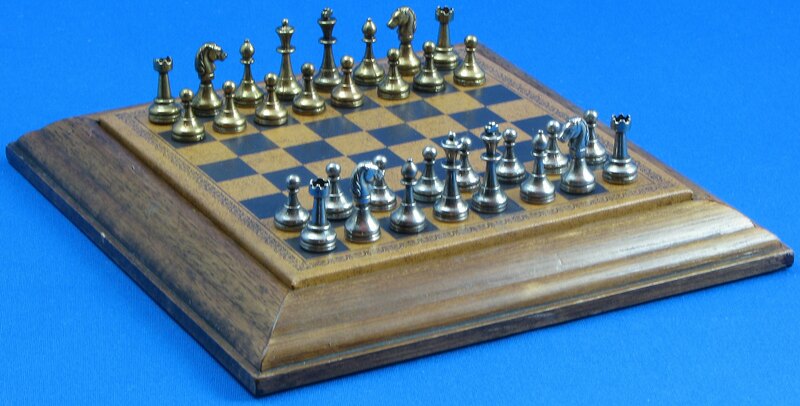 This chess set was bought in Berlin and, in spite of the famous Polish chest, could be German. The blue knights were absent, but it was promised to send them after. Only 1 came, so we (me, a friend and an experienced restorer) did make a copy. I did some smaller restorations as well. Note that some pictures show the imperfections before restoration. This set is not unique, I have seen another on Ebay. Actually it is more a decorative set as a set to play with. Poland. This odd abstract set was an early addition to my collection, bought from Johan van Mil and Erika Sziva in 1998. They could not tell other things about the set but it's Polish origin. You may say that these 2 sets are more decorative as to play with. Maybe I should move them to section "To look at" ? Rumenia. This is a well known Rumenian travel chess set with an ingenious system to fold the board, while keeping the pieces on it, when you close the box. There are some small variations in the sets I have seen. Although I do have only one, I could make a compilation picture of 3 different ones. It is the last picture in the gallery. Russia. I have listed these sets in order of age, more or less. The list starts with a lesser known Carbolite chess set from a factory that used to make Carbolite (kind of Bakelite). The company still exists today. The set has hollow pieces, which are filled with sand (or so) to make them heavier. Note that the pictures of the box are copied from the internet. Russia. The small travel set is most likely a tourist souvenir from Leningrad. Cannot say much about it, but it is from Russian Federation of about 1970. Russia. Here you see three "Russian tournament" sets. One is a pre WW2 set and the 2nd a cheap recent version. The 3rd is an amusing version with politicians. Just look at the pawns and try to identify them all! The "Russian tournament" set is characterized by the finials in the opposite color on the Kings and Queens, which are also very similar in shape, and by the Bishops without incision. 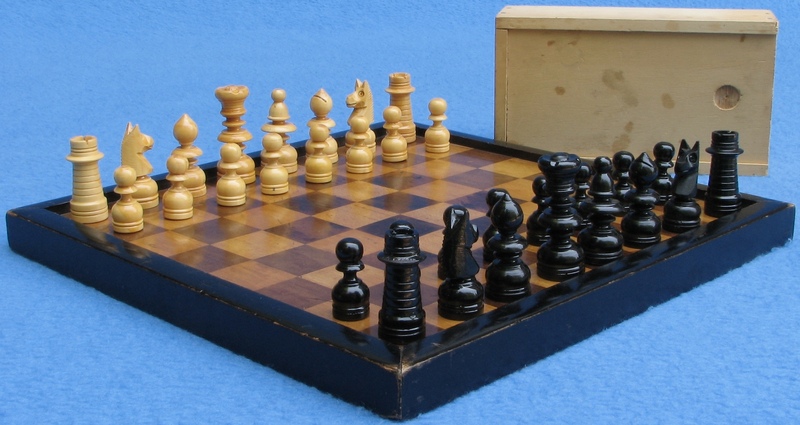 Another "Russian tournament" style chess set can be found on the Unknown page. Russia. The "Carved" set is made by hand, but I can't tell which wood it is. The older sets were made of hardwood and carved by hand. The more recent versions are of softwood and machine cut. I cannot date this set well. 1980 is just a lucky guess. But this handmade set is rather older than younger. Russia. I have added the "Matrioska" set, although you may argue it is more a decorative set. But you can play very well with it. The shape is not only based on the so called Matrioska dolls, but the set is actually named that way as the pamphlet tells us. Sorry, I have no picture of that pamphlet (yet). Russia. The last in this list is a "Barleycorn" based set by the Chess Sets Gallery, Moscow. The design is by Oleg Rakis, who was inspired by the Barleycorn sets. Russia, Moscow, by Chess Sets Gallery, "Barleycorn"
Spain. The 1st Spanish travel set in this list is one of my favourites. I love the simple form of the pieces and think it is a real beauty. The board is less impressive and has the clasp replaced, but does it's job well. Spain. The 2nd travel set does have neat pieces in the "Staunton" style. The lacquer has been unaffected, so I think it was never played with. I bought both travel sets in the same antique shop in Barcelona. Spain. The typical Spanish design of the playing set does have some Régence and Staunton influences, but stands completely on its own. I bought the set on a flew market in Barcelona for little money. Probably the set has never been used, considering the condition. Spain. This tiny chess set was a gift of a friend, who had bought it in Spain long ago. Most likely this set is a doll house set. Too small to play with. It is the smallest in my collection. Turkey. This playing set has clear influence of Régence sets, not to say it is a Régence set. I bought this set in a post located antique shop in Istanbul. The elder shop owner told me that he used to play with it from the 50ies on, when he was a child. I love this set because of the primitive way it has been made and the history it has. Turkey has a long tradition of making abstract onyx chess sets for the tourist market. I have 2 examples. The 1st was a gift of someone in my street, who had bought it on a holiday in Turkey long ago. He didn't know exactly when, but it could be in 1975. The 2nd one was a gift of a boyfriend of one of my daughters. He had just bought it for me in 2004. In almost 30 years not much has changed, except for the packaging. Sets listed below are of Unknown origin and/or age. This "Russian tournament" style chess set was bought in 2004 in Istanbul, just 1 year before Hippopotamus ivory was put on the CITES list. I have placed it under unknown, because I'm very uncertain where the set has been made. According seller it is a Russian set of the 1920s. Could well be in my opinion, but I'm not sure. Another theory is that in the 1940s these sets were brought to England from French North Africa by soldiers of the second world war. In England these sets would not be uncommon. However I have never seen another. Have to say that it is one of my favourites, not only because of the material, but also because of those beautiful Knights and the fact that they are very playable due to their stability and weight. Very clear colour difference as well. I can't tell anything about this wooden playing set. I don't think it has been made by an amateur, although it looks like that on first sight. Only thing I can say is that I bought it from a chess enthousiast in the Netherlands. This wooden playing set looks as made by an amateur. Only thing I can say is that I bought it from the same chess enthousiast as the other wooden playing set. This metal "Burmese" set is more a curiosity. Further I would put an antique ivory "Burmese" set probably under "To look at". So I'm not sure I will keep it listed here. This abstract set of glass is beautiful and one of my favorites. People always ask if I have a glass chess set in my collection, thinking on those common (small) Staunton glass sets they mostly have. I do have some as well and you can find them elsewhere on my site. But a set like this is always impressive. Set listed below is of Unknown origin. This "travel" set was bought recently with the main reason that I have a travel set with exact the same pieces, which was bought in the Netherlands in 1948. See my Travel (Netherlands) page. Jaques did sell travel chess sets in a leather case with exactly the same pieces. The pieces must have been made by the same manufacturer, but unclear is who that is. Not much can be said about this plastic travel set in the Staunton style. This kind of sets were often used as advertisement items. There is some logo, with a chess motive, on the outer plastic shell, but I do not know the meaning of it.